This kit is an Optical-triggered Powerful "Slave" photography flash. And will automatically fire itself (by optical detection) when another flash is fired nearby. Trigger Sync input a 3.5mm sync socket is included to allow triggering by a sync cord. POWERFUL: The 50ws kit fires a flash as powerful as a FULL POWER FLASHGUN. 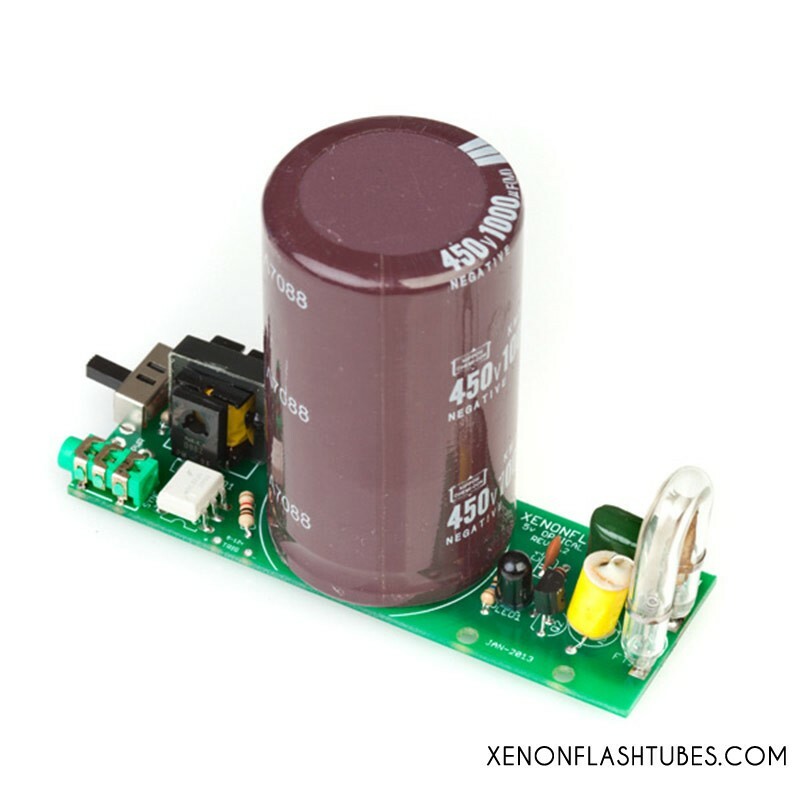 You can use this board as a basic learning kit on how Xenon flash works, or even use it as a base circuit and modify it according to your project needs. It can easily help you in lighting different places in a scene or just as background lights... use your imagination ! According to the part list, identify R1-R4 using the given color codes or refer to the image below. Place R1,R2,R3 and R4 on the PCB, polarity doesn't matter. Go ahead and place C1 and C2. quite simple: C1 is the orange disc shape component, and C2 is the rounded-corners-square green component marked "473". Now solder them all in place and clip the excessive legs off the solder side. Now pay attention: insert the D1 diode into it's place, while the diode's marked white side is oriented to the PCB's marked bold white stripe. Same for LED1, place it into the PCB, with its flat side to the PCB's marked flat side, like explained in the picture below. Now for Q2 - it is the small black transistor half-round shape - place it into the PCB while its flat side is facing the flat side of the marking. 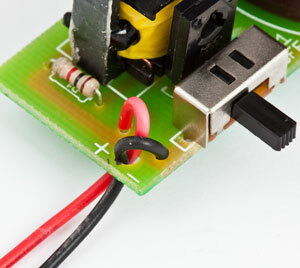 Take the T1 square yellow transformer which has 5 pins (XFT-1610) and place it, should snap in easily, and solder it. Q1 is the rectangle flat transistor (TO220 package). Screw Q1 to the heatsink as shown on the photo. 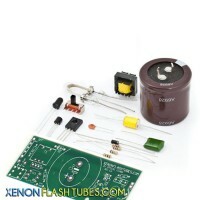 Place the assembly into the PCB with the black plastic side of Q1 facing the big transformer. Solder it keeping the full pinlegs length. As high as possible above the PCB, to keep enough space for the Sync jack. A little effort, just a few components left: the Trigger coil (yellow, 3 wires) , the U-shape flash tube, and the big capacitor. 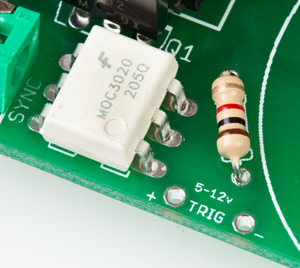 The trigger coil T2 should be soldered with the 2-wires side facing down the PCB. the center thick wire going into the hole in the center of the round PCB marking, and the very thin wire at the same side of the coil is going to the small hole right below the circle. The remaining third leg facing upwards, should be bent down 180 degrees and should be soldered in the nearest hole on the right. Step 5: BIG power ! 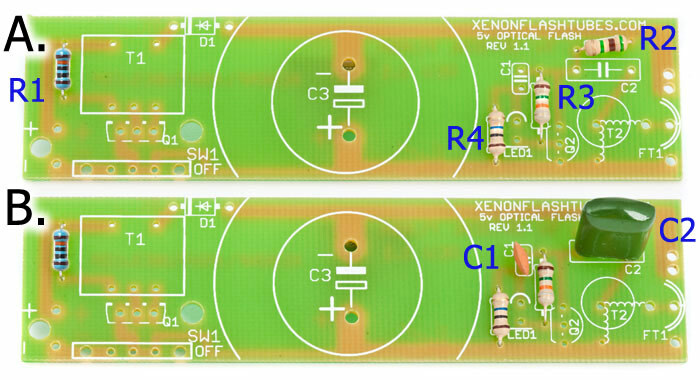 Place the BIG capacitor C3 into the PCB while the NEGATIVE PIN IS MARKED BY A WHITE STRIPE ALONG IT. Polarity is extremely important here. 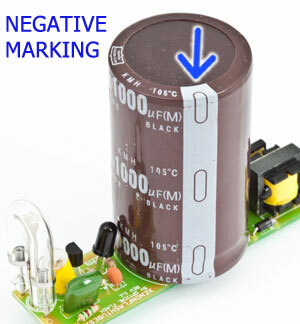 so the marked side of the capacitor faces the "-" side of the PCB marking. 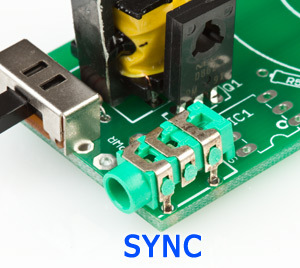 Place the 3.5mm Sync socket on the corner of the PCB, and solder it. The sync voltage through this socket is about 7v. If you ordered a battery holder, or want to use a wall adapter, you can solder them directly to the PCB, according to the "PWR" + and - markings. Don't forget it will accept a voltage of around 5v - 6v . The optocoupler gives you an optically-isolated interface from the flash circuit power source, and the high voltage part, for a maximum safety. just solder it in the IC1 place, and solder a 1K resistor (not supplied) at the R5 marking. 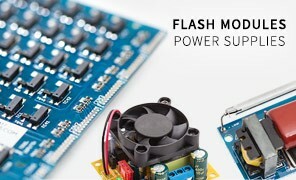 As you apply a voltage at the "TRIG" terminals (polarity matters), the unit will trigger the flash. .